I was looking through your website and was hoping you could help me. We just had a fiberglass pool installed in Michigan. When they were installing the pool and leveling it over and over it droped from the crane. They assured us it was fine but now we are seeing white streaks on the bottom and sides of the pool. It looks like someone took a paint brush with white paint and painted the bottom. I've looked through your site and am wondering if it is spider cracks in the gel coat from the drop or the leveling or possible from a faulty pool shell. I've contacted the pool company and they are still trying to figure it out. They havent physically come to see it but I have emailed pictures. I was wondering if you could take a moment of your time and give me your expert opinion. I have included the pictures. Although fiberglass is easier on chemicals, this is one of the drawbacks of having a fiberglass pool. Due to their nature, fiberglass pools may have some spiderweb cracks in them. Not all of them, but some. 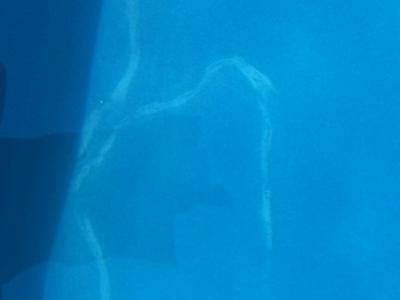 Most of these cracks are superficial and should not affect the integrity of the pool. This is due to construction and the gel coating they receive during the manufacturing process. The questions doesn't say how far the drop was, so I can only guess. I'm wondering if the white streaks appeared on their own, or did someone try to cover them over or do a temporary fix? Your question says "It looks like someone took a paint brush with white paint and painted the bottom." If they did, here's some questions to ask: Why did they do that? What product did they use? Is this normal procedure to fix a crack like this? If so, can you show where it says that? How long will this repair last? there's a leak in the cracks, who will come out to repair it, a rep. from the company or a sub contractor? Are they licensed? By whom? The cracks could have been their already. The drop or uneven leveling may have exacerbated a problem that was already present. Not personally being at the site, it's a bit difficult to determine from the picture if it is from the drop, poor quality, or both. What I would advise you to do is not fill the pool just yet and stop all installation until you can get a rep. from the company to take a look at it. Don't touch the pool nor allow anyone else. This is between the fiberglass company and the installer. They need to come to a decision on how to fix the problem. If you fill the pool, you're putting thousands of pounds of pressure on the surface of the pool. Anything that you may do may cause the company or installer to put partial blame on you. They can say "It wasn't like that before, but you did such and such, and now it's worse. That's not covered under the warranty". If it was truly damaged by the drop or uneven leveling, then anything extra done to the pool or job site will cause a delay in getting your pool up and running. The installer was either directly from the fiberglass company or a sub contractor. The company should have a warranty/guarantee against workmanship and the sub contractor for installation. Take lots of pictures and videos. Document everything, including names, times, and dates. Hopefully the company and installer can resolve the issue, but if they can't or there's a delay, you have recourse because of your documentation. To post a reply, or if you have a similar question, you can see your post on the Q&A page in the "Fiberglass Swimming Pools" category. Check back to this post for answers. I have a Leisure pool that came with small white spots. The mfg. has been out 4 times to repair. Each time the blue gelcoat is applied to cover them, the turn white. We went from little spots, to big, to giant now 3/4 of the pool bottom is white. The gelcoat mfg. attended the last repair. It appears this is a trend from my research. HK products cannot match the blue gelcoat in the field. I just spoke with another customer who finally had Leisure tile their whole floor to cover the problem. I forgot to add that the gel coat is a marine blue. This is a little darker than a powder blue so you can see the white marks clear as day. Thanks for the reply and all the great information. I guess the pool was dropped about 20 feet from the crane. I've taken a closer look at the pool now that the water is still and can see five, foot long hairline cracks in the fiberglass. What are your thoughts on that? Many fiberglass pool have multiple layers. 1 - 2 gel coats, an epoxy layer, a resin layer, etc... A drop from 5 feet is a little different than a drop from 20 feet. Now, I had 3 fiberglass pools when I had my pool route in Arizona. They all had the hairline cracks in them, but they never leaked and were very good with chemicals. BUT, the pools are never closed. Yeah, the water temperature may get down into the 40s or so, but not frozen solid. In Michigan, you probably close the pools because of the harsh Winters. This will cause the pools to expand and contract just a bit which will put more stress on the cracks. It's not so much the hairline cracks, which are easy to fix. It's what's underneath the cracks that should be a concern. It's the possible structural damage to the pool. The reinforced laminate might be broken or cracked. If this is the issue, you're more than likely going to have eventual leaks. This means draining the pool and getting it fixed. Refilling the pool (another added expense) and balancing the chemicals again (another expense). I have a general understanding about fiberglass pools and have repaired a few, but I've never built them. You must be sure the structural integrity of the pool is intact. And that can only be done by someone from the fiberglass company or an authorized sub contractor. I would get everything in writing. Have the pool examined by a qualified tech to be sure the pool is structurally sound and in good shape. Once they've done the job of inspecting the pool and say all is well, you'll want to get that in writing. Name, date, signatures, exactly what they've done etc... Don't be hesitant to press the issue. I've seen too many pool nightmares and many pool contractors who get their money and go on to the next site. Hope this helps and keep me informed. We are getting a fiberglass pool made by hatteras pools put in right now. They just finished filling the water and are finishing up getting the pump set up. They haven't done the concrete yet. We went for our first swim today and noticed an approx 3 in crack the feels deep. It's on the corner of a small ledge in the deep end. What should I have the installer do? I'm worried that a quick fix will lead to leaks and lots of money later on. I don't want to be stuck holding the bill in a few years or have issues when we sell the house 5 yrs from now. Hi Helen. If the pool didn't have a crack before installation, but developed one afterwards, the installer needs to take care of it. Some reasons could be wrong installation. The ground might not be level. Horizontal cracks can indicate the ground is uneven due to improper installation. The only solution is to reinstall the pool. The gel coating might be coming off, but with a brand new pool, this could probably be ruled out. Merely filling the pool can result in cracks. Water pressure is exerting force equal to the surrounding areas. And last would be poo quality. In any event, I'd get the installer out there to take a look at it and see what can be done. The above info. can point you in the right direction.